Muscle injuries are very frequent in football. The primary goal of every rehabilitation is a safe RTP with a minimal risk of reinjury. The biology of tissue healing as a gradual process has to be respected during rehabilitation. Thus, different absence times are needed depending on injury type and the size of the tissue defect to restore the function and load-bearing capacity of the muscle. Exercises for neuromuscular function, core-strengthening and proprioception should be included into a rehabilitation programme. It has been shown that classification and sub-grouping into injury type and dimension of pathology can have a prognostic validity for RTP. However, there are no consensus guidelines or standardized criteria for safe return to sport following muscle injury. The value of strength testing and MR imaging as RTP criteria is controversially discussed and remains unknown. 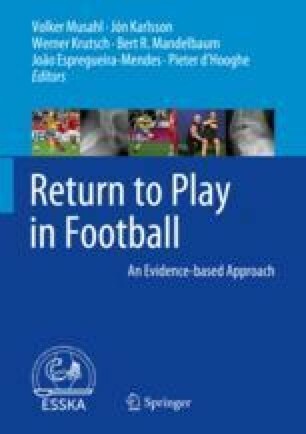 This chapter describes the various factors that a medical team should consider during rehabilitation of an athletic muscle injury with particular focus on RTP and professional football.